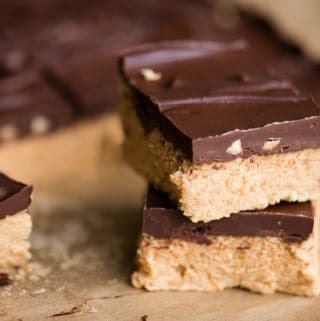 No Bake Chocolate Peanut Butter Bars are a rich and decadent dessert that taste just like a giant Reece’s Peanut Butter Cup! This is a layered bar dessert that requires no baking, just some melting in the microwave. This is a great dessert for parties and potlucks too. Who doesn’t love chocolate and peanut butter? 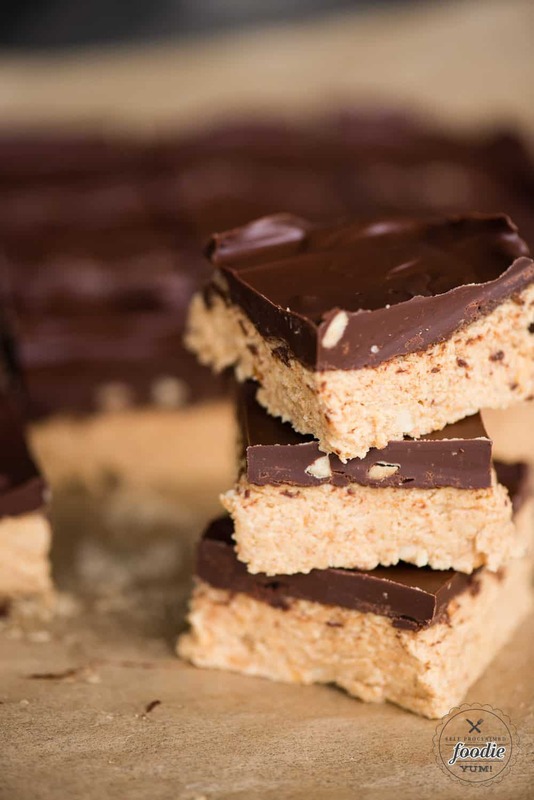 No Bake Chocolate Peanut Butter Bars are the perfect summer dessert because they satisfy all cravings without having to turn the oven on! It feels like this summer has been particularly hot and I have been avoiding having the oven on at all costs. My little toaster oven has been used instead for anything that fits! This is one of those naughty dessert recipes that is in no way good for you, but boy does it taste good! It’s sort of based on my ever popular Five Minute Fudge but also my snickers peanut butter fudge. Which is better? Chunky or smooth peanut butter? If you ask me, chunky is always better. I wasn’t a fan growing up, but now I much prefer the texture of having a bit of crunch mixed in with all of that thick and creamy. You can use either smooth or creamy peanut butter in this recipe, but I recommend finding a no-stir peanut butter. The natural peanut butters that have a layer on oil on top just complicate things. I also recommend trying to find a peanut butter that doesn’t have added sugar as I find that the sugar in the recipe is plenty. As long as your peanut butter isn’t too sweet, you should be fine. These are two layer bars. The bottom layer is the peanut butter layer and the top layer is mostly chocolate with some peanut butter mixed in. I recommend using a 9×9 square baking pan lined with parchment paper. Lining the pan will make it easy to get them out. 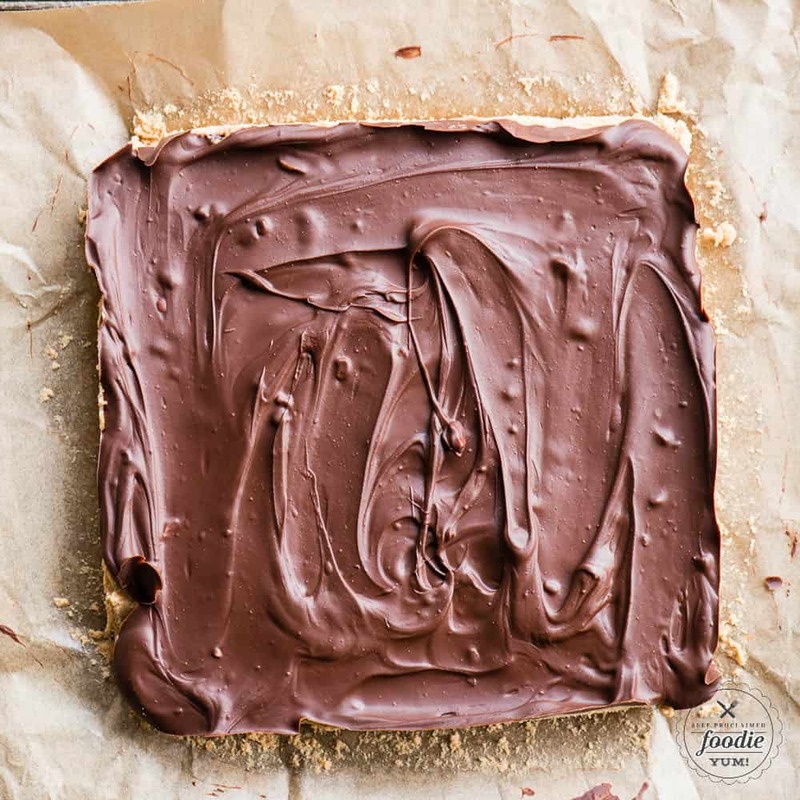 First you’ll cream together all of the peanut butter layer ingredients and add them to your lined pan. The secret ingredient that not only adds sweetness but also texture is graham cracker crumbs. You can either add graham crackers to a resealable storage bag and use a rolling pin to crush them, or you can run them through the food processor which is what I did. You will need to chill this layer. The freezer works fine. Next you’ll make the chocolate layer. I just melt everything on half power in the microwave and give it a good stir every minute or so until everything has melted. Pour this over the peanut butter layer and chill again. You definitely want to keep these cold as they will get very soft if not cold. I warned you. 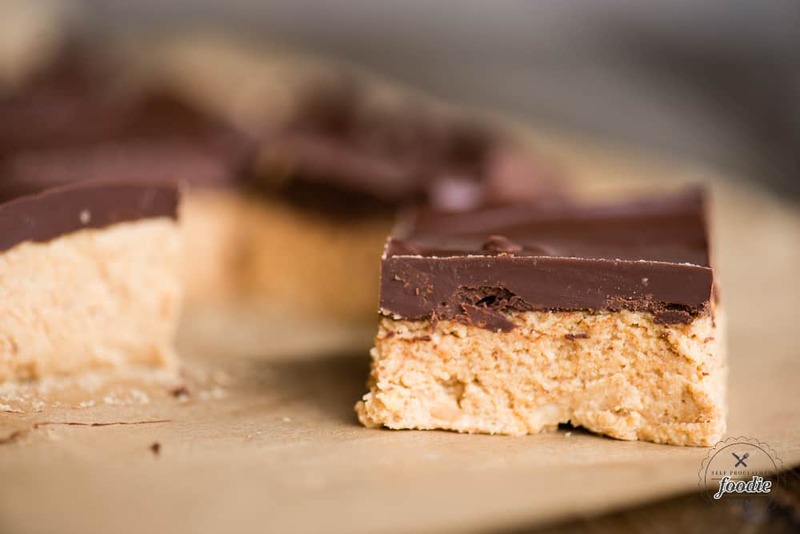 No Bake Chocolate Peanut Butter Bars are a rich and decadent dessert that taste just like a giant Reece's Peanut Butter Cup! This is a layered bar dessert that requires no baking, just some melting in the microwave. This is a great dessert for parties and potlucks too. Who doesn't love chocolate and peanut butter? Line a 9 inch square pan with parchment. In the bowl of a stand mixer, cream together butter, crumbs, sugar, and peanut butter. Spread into flat layer in prepared pan and chill for one hour. Once the peanut butter layer has been chilled, you can make the chocolate topping. Melt chocolate chips, peanut butter, and butter either in a double boiler or in the microwave at 50% power in one minute increments until smooth. Spread over chilled peanut butter layer. Chill in refrigerator at least one hour before slicing. If it is not cold, the peanut butter layer will be soft. To cut, dessert out of pan using parchment and set on cutting board. Use a sharp chef's knife to cut into 25 squares. Keep chilled as the peanut butter layer will be soft if brought to room temperature. I even recommend keeping them frozen until serving, especially on hot summer days.